Your Customers Are Mobile Ready, But Are You? Over half of all website visits now come from mobile users. A responsive website, once a nice to have, is now essential, particularly if your website is transactional. Well over a third of all online sales are made on a mobile. I suspect the current figures are higher than those indicated above and which are based on IMRG and Capgemini research published earlier this year. We know that the speed of our collective take-up of innovations is increasing exponentially. 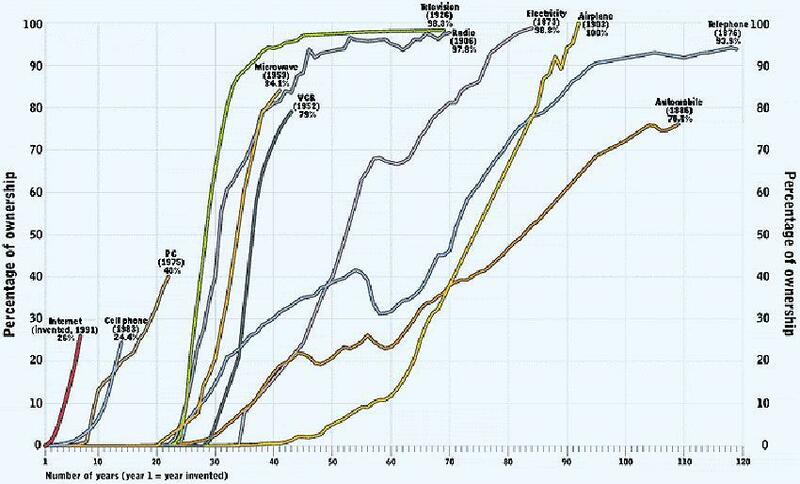 Way back in 1997 Peter Brimelow published a blog in Forbes Magazine originally accompanied by the chart below. I rest my case. But, while collectively our adoption rate is increasing, it isn’t automatically reflected in smaller groups. A variation of the wisdom of crowds if you like. Work done more recently indicates that if you get the right small group together, you can overcome this and make good decisions. So, what does this mean for small(ish) digital teams looking to develop mobile first sites for customers and user bases? 1. Don’t assume that because your team are mobile users that they’re in a position to judge what you’re planning. A little (mobile) knowledge is a dangerous thing. Instead, develop a core group of über users, from both within your team, and across the organisation as a whole (on top of any focus groups and customer research you should be doing). This group should reflect your customer personas in terms of age, socio-economic demographic and mobile use, but it should also be diverse. Diversity is a key positive when it comes to ensuring good decision making in small groups. Use them to help specify and verify a project as it develops (not just imminent launch testing). 2. Conduct an informal mobile audit across your team in terms of what phones they use, what they use them for and what phone-based tech/apps they rate. This will give you a much better feel for their mobile savviness. If phones are provided or paid for as part of an employee benefits package, find out what flexibility you can build into this. Can you include a discount or shortlist, rather than specifying or supplying specific phones? Blackberries may still have residual business allure, but the chances are your most desirable mobile customers are upgrading to the latest iPhone, or at the very least, a large screen Samsung Galaxy Note. See the 10 best mobile phones right now. Also, ask people what other mobile tech your team uses, such as tablets and even wearables (which are penetrating fast and are liable to be the popular 2014 Christmas gift). 3. How exactly do you and your team use mobile? Let your fingers do the specifying. (Hover is sooooo last year). Often, the most monumental digital decisions are made sitting around a big table covered in copies of contracts, project management timelines and the small print of post-launch service level agreements. Your customers are going to judge your mobile responsive site physically as well as intellectually – particularly when it comes to touch. Touch responsiveness is increasingly more important than how your site responds on click or hover. And even desktop machines come with touchscreens these days. It’s not just a question of where touch responsiveness is now, but where it might be in a matter of months not years, with companies like Apple leading the charge. 4. Your own team can be a useful source of peripheral mobile market information, particularly when it comes to price points and what they might do to your mobile user demographic, so value them as a sounding board. For example, when slightly older tech becomes cheap, you suddenly get a new wave of penetration, possibly involving a new or refreshed audience group e.g. first time purchasers into the tablet market, once they lost their breathtaking price tags. So, if you have a well-paid senior team made up of technology early adopters, you might miss this. Make sure conversations around mobile responsiveness and gadget price involve younger (less well paid) team members and interns. They may not be your user market, but they are often more budget sensitive. 5. Finally, you may think you have the most mobile-savvy team on God’s green acre, but there was once an emperor who felt the same way about purchasing new clothing. Back decisions with sounds evidence, rigorous testing and plenty of review points built into the project timeline, designed so you can refine and tweak as you go. This post was written by Anne Caborn who delivers Emarketeers’ Digital Content Strategy course.